The Tech Works HM-1 Hidden Microphone is designed and constructed for use in Interview and Interrogation applications where a highly sensitive voice microphone can pick up the conversation while not being seen. 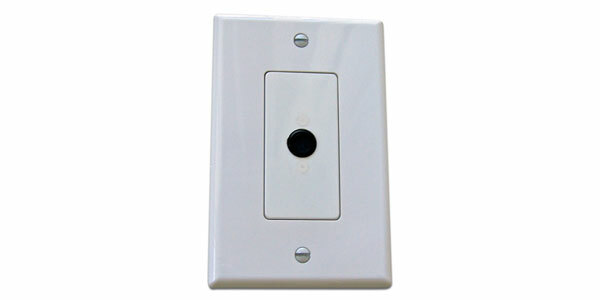 The microphone is mechanically shock resistant mounted on a nylon deco wall plate. All mounting hardware and a single gang white nylon trim plate is included. Rough-in is a standard single gang electrical box. An electronic balancing circuit shapes the omni-directional microphone for high voice band sensitivity while adapting it for low impedance connection over long wire lengths with minimal noise. Wiring is a standard twisted, shielded audio pair cable connected by screw terminals. This product is specifically designed and manufacturer for use with the IC-52 Intercom Amplifier. The Hidden Microphone shall designed and constructed for use in Interview and Interrogation applications where a highly sensitive voice microphone can pick up the conversation while not being seen. The microphone shall mechanically shock resistant mounted on a nylon deco wall plate. All mounting hardware and a single gang white nylon trim plate shall be included. Rough-in is a standard single gang electrical box. An electronic balancing circuit shall be included to shape the omni-directional microphone for high voice band sensitivity while adapting it for low impedance connection over long wire lengths with minimal noise. Wiring shall be a standard twisted, shielded audio pair cable connected by screw terminals.The Hidden Microphone shall be Tech Works model HM-1.